After the harvests, the winemakers of Bourgogne prune the vines with care to preserve their fertility. This is also a time to work the soil, which protects the vines from the rigors of winter. The French use two words, rameau and sarment, to describe the same part of the vine at different stages in its life. From when the first leaves start to appear up to the month of August, the branches are called rameaux (shoot) and are green. When cold hardening occurs, which is the point when the canes mature, they change color, turning brown, and from then on are known as sarments (cane). From a botanical point of view, we are dealing with a vine in the true sense of the word. If it is not pruned, it will grow without stopping, like a creeper. Pruning thus helps the vine to grow again with renewed vigor in the springtime. Traditionally, pruning should be finished by the beginning of March. But in reality, the date by which the task is complete varies from estate to estate and the job can be carried out throughout winter. Some winegrowers do pre-pruning. This helps clear out the trunk of the vine by removing any excess canes to facilitate pruning. Different winegrowing regions have different pruning styles. The most common shape in the Bourgogne winegrowing region is Guyot pruning, (either simple or double). There are other more specific shapes that are used. In Chablis, “Chablisienne” pruning is popular, and farther south you might find “l’arcure mâconnaise.” If you are ever strolling through the vines, get up close and try to recognize each pruning technique. With a little practice, you’ll see it’s not so hard. This task may seem simple but it requires a great deal of practice and an expert eye. The person pruning must select those canes and buds to keep, and which will bear the harvest. And the essential tool for pruning is, of course, the secateurs. The pruned shoots stay attached to the wires supporting the wines and people known as tacherons are employed to remove them. The action is called “tirer le bois” and the clippings are then gathered up and burned in special burners, which are often homemade. 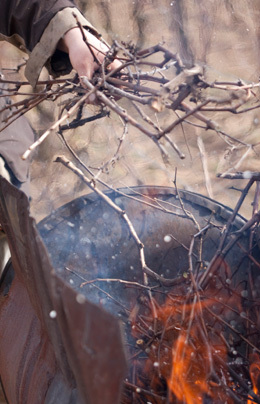 Pruning is carried out in the winter so these little fires help heat up the workers. 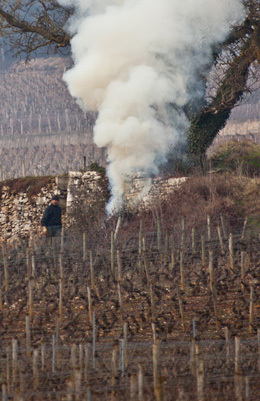 That is why you will often see plumes of smoke rising here and there in the vineyards in winter. To make the grapes grow, the vine draws its resources from the soil. It is therefore necessary to maintain the soil and ensure it is balanced and healthy. • Earthing up: This task protects the vines from winter frost. It must be carried out before the first frost. • Tilling: When planting new vines, the soil must be ripped or tilled to a depth of 40-50cm on average in the Bourgogne winegrowing region, to break it down and remove any stones. The winemaker performs this task with a special plow called a “défonceuse”. These tasks have to be carried out in the fall before the cold sets in. To top up the nutrients in the soil, which has nourished the vines throughout the growth cycle, the necessary elements must be added. These include nitrogen for the vegetation, phosphate for fruit development and a healthy plant, and potash which helps develop the sugar in the juice as well as resistance to disease and frost. The soil is one of the key components of the terroir. It must be preserved to guarantee the sustainability and quality of the wines of Bourgogne. In the Bourgogne winegrowing region, the vines on each plot are replanted every 50 years on average. Notwithstanding, the winegrower usually has to replace a few dead or sick plants each year. These vines are pulled up before the springtime. In regulatory terms, a plot must not be lacking more than 20% of its vines.